The Hills Have Eyes' British reputation has largely rested on its membership of the Daily Mail's original 'video nasty' club, but it is much more than that. For starters, Wes Craven's 1977 film was never part of the 'stalk and slash' genre which dominated that hate-list as well as the late 70s/early 80s horror boom. Halloween bred a plethora of look-alikes, each upping the ante by inventing bloodier and more sadistically comic ways of saying "Boo!" and offing teenagers. But while all those flicks today look and feel very dated, The Hills Have Eyes has retained much of its power because of its greater interest in the dark side of the human psyche. It does have many seriously grisly moments - a disembowelled dog, a gnawed-away Achilles tendon and cannibalism, to name but three. Its iconic poster - featuring actor Michael Berryman - gave it the appearance of a freak show and made it one of the original Punk movies. But at the film's heart is a disturbing and relentlessly pursued theme. To survive their encounter with a feral clan of murderers, an all-American family must become as bestial as its enemy. The potential for atavism lies within all of us, the film says. One feels that this was what really bothered the censors, moral guardians and other soapbox BS merchants. Going further, the cheapo production values, often amateurish acting and rough-and-ready camerawork even now make The Hills Have Eyes play like the nastiest fly-on-the-wall documentary you have ever seen. Its violence, while extreme, is put to the service of an implacable realism from which all attempts to imply or infer any moral judgements lead to the grimmest conclusions. Again, you can agree or disagree, but don't deny the argument. With the benefit of 26 years' hindsight, you could make a case for setting the film less beside its horror cousins and more alongside its mainstream contemporaries such as Martin Scorsese's Taxi Driver (1976) and Francis Coppola's Apocalypse Now (1979), as part of a wave of seventies cinema that saw US directors picking over mankind's more vicious flaws in the wake of the seemingly feral defeat their country suffered in Vietnam. There are also undeniable echoes of Brit director John Boorman's more nightmare-like Deliverance (1972). Again, though, this awkward film will slip your grasp. That core idea about the beast within goes back into ancient myth and stretches forward to today and Peter Jackson's 21st Century take on The Lord of the Rings (What else is all that Frodo-Gollum stuff about?). Craven's extraordinarily unpleasant fable, though, is arguably more honest. There is no Elvish boat waiting to carry the 'good' away and assuage the shock and pain of self-discovery, just a climactic fade-out to, appropriately, red. 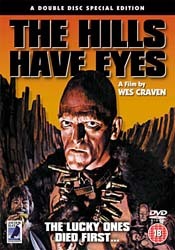 Thanks to an excellent two-disc DVD release from Anchor Bay, The Hills Have Eyes is finally available uncut in Britain. The digital restoration should help a great deal in correcting the film's reputation. Not only does it foreground the importance of the film's desert locations as an extra character in the story, it also replaces a series of often unwatchable and inaudible VHS transfers. The generous extras make for valuable viewing, particularly in presenting the case for Craven's broader importance in and influence over contemporary fantasy and horror. He has proved - with George Romero and David Cronenberg - to be one of the few enduring, imaginative and original artists to emerge from the seventies horror stable. This is the director who later breathed new life into stalk-and-slash with the first A Nightmare On Elm Street (1984) and then - with writer Kevin Williamson - thoroughly subverted it with the slyly post-modernist Scream trilogy (1996-2000). On this Anchor Bay release, a specially-produced retrospective- just under an hour long - does justice to a supposed gore-hound who turns out to be an articulate and thoughtful former college professor. In this and on an excellent commentary track, Craven comes across as a direct and honest filmmaker, willing to admit his own limitations, to instances where necessity was the accidental mother of invention, and to where he plain screwed up. A further bonus is Adam Simon's excellent 70-minute US TV documentary The American Nightmare. It takes a broad view of horror's development from the end of the sixties through to that 'nasty' boom. Again, it underlines the shocking mistreatment that films such as this have received from mainstream film and cultural critics. The Hills Have Eyes may not be a masterpiece, but it is a vital and important work. Anyone interested in the history of horror and how it can be as much a forum for ideas as any other genre must see this film. And now there is no excuse not to - it has not been available in a better condition since its original release. While one must hesitate to call the film's return a 'pleasure', it is very welcome nonetheless.